We are a non-profit making, independent user group, run by a committee of members. We provide a forum for like minded customers to collaborate with other customers and IBM themselves on all aspects of IBM's ITSM portfolio. Specifically we concentrate on; Event & Application Performance Management, Cloud Computing, Cognitive Analytics and Workload Automation. Please RSVP for just ONE of the tracks, you can swap track as you wish on the day. Don't miss this opportunity to meet with other users and discuss current innovations and challenges within your roles. You'll be surprised at how valuable sharing experiences can be. We generally have two face to face meetings a year and ad-hoc web presentations. 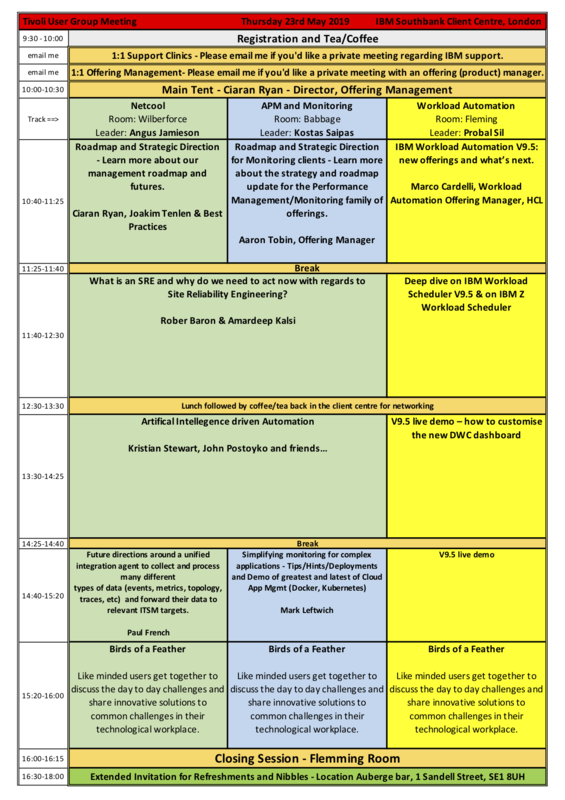 The next meeting is on the 23rd of May 2019 in London, why not come along and meet the other users. This meeting promises to be full of new and interesting technologies and use cases as well as giving us all the chance to discuss solutions with our peers across the industry. If your company would like a 1:1 meeting with IBM support or IBM Offering Management then please email me tivoliusergroup@gmail.com with your request and I will get back to you re a suitable meeting at some point in the day. The sun will shine in Hursley on Tue 26th of June so why not come and learn some new skills in a wonderful location?